Wash the potatoes thoroughly. Pressure cook the washed potatoes upto 2 whistles so that they become partially cooked. Let the pressure cooker cool down and the steam escapes completely. Uncover the lid and drain the potatoes out. Once they are cool enough to handle, peel them and prick each one with a fork. Heat enough oil in a kadhai/wok for deep frying the potatoes. Once the oil is hot, fry the potatoes in batches on medium heat until they turn golden brown on all sides. Take them out using a slotted spoon and set aside on a plate lined with paper towel to soak up excess oil. Take out all the oil used for deep frying from the kadhai leaving only about 2 tablespoons behind. Temper the hot oil with cumin seeds and hing. Make a smooth paste of spices by mixing turmeric powder, coriander powder and Kashmiri red chili powder with ¼ cup of water. After the oil become fragrant, add this spice paste to the kadhai and sauté on medium flame until the oil starts to release from the spice mix. In the meantime, whisk yogurt until it becomes smooth. Add beaten yogurt to the kadhai keeping the flame on minimum to avoid splitting and keep stirring constantly until the spices starts simmering. Now add fennel powder, ginger powder, clove powder, cardamom powder, sugar and salt to taste to the yogurt-spice mixture. Stir them really well to combine. Add a splash of water if the spices start to stick to the kadhai. Once the oil starts to release again from the spices, add about 1 to 1 & ½ cups of water and bring it to boil. Once the gravy starts to boil, add the fried potatoes, cover and simmer on low for 15 minutes or until the potatoes are soft and completely cooked through and absorbs the flavors of the spices. After about 15 minutes, check and adjust the consistency of the gravy – boil off any excess water and keep the consistency thick and clinging to the potatoes. Check and adjust seasoning if needed. Turn the flame off and sprinkle garam masala on top and garnish with freshly chopped coriander leaves. Cover the Kashmiri dum aloo for 10 minutes before serving. 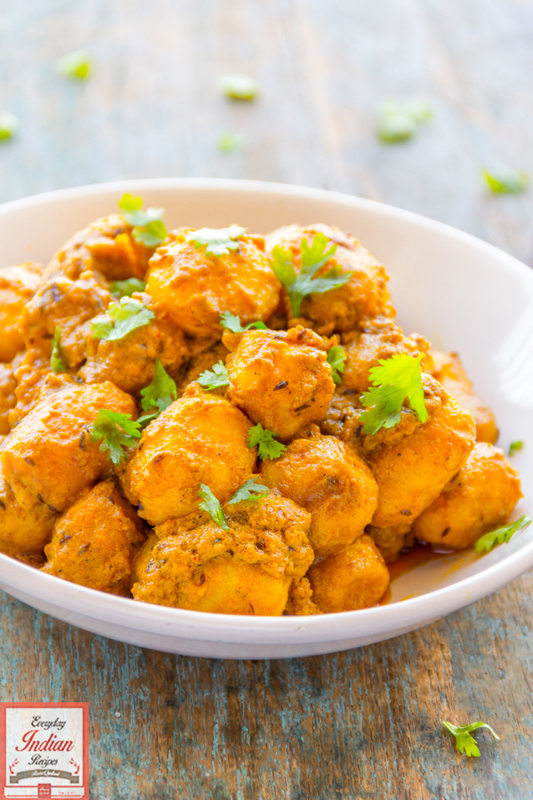 Enjoy the Kashmiri dum aloo steaming hot with chapatti, naan or phulka!